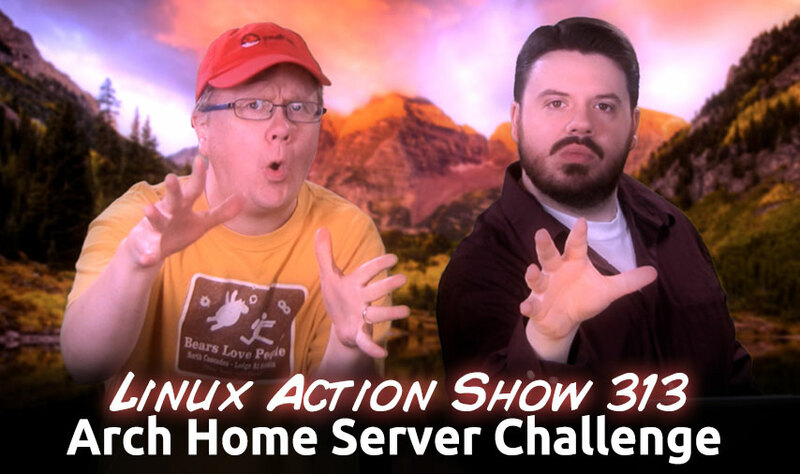 Coming up on this week’s episode of The Linux Action Show! Arch Linux can make the perfect Home Server, we’ll share our tips to build the ultimate home server running the latest software, powered by Arch Linux. Outside of a few exceptions, an Arch server should be an absolutely lean machine, with only the packages required to perform a specific function. Additional functions should be spun out into separate VMs when possible. VMs are cheap, containers are even cheaper. We use a Template with a base Arch install, with the correct uids for NFS, the correct groups, and the basic file system mounts entered to fstab. This also simplifies the Arch deployment process. The best server is a headless server, with no GUI. When you toss out the GUI, the usability playing field for setting up a server gets leveled out to nearly flat. The invaluable amount of help that comes from the Arch Wiki in many ways gives Arch a usability boost over other possible distributions for a headless home server. So over the past few months or so I\’ve been just been throwing often-used commands and links into a Google Document to get me up and running quickly when I want to spin up a new Arch installation. Proxmox supports a mix of KVM Virtual Machines, and Linux containers. Arch currently (I believe due to a systemd bug) runs best in KVM, not in a container. Arch might make a better Linux Container candidate after that bug is fixed. Our Proxmox box is a Core i7 rig, with 1TB of internal RAID0 storage. Important data is stored on the NFS FreeNAS box. We run one Arch VM from the internal 1TB, and one from the NFS mount. FreeNAS was our selection for the back-end storage. A btrfs powered server was considered, but upon a mighty reflection induced by our recent poll, ZFS seemed like the wiser choice. ZFS does work on Linux, but the utility aspect of FreeNAS appeals. When the application stuff is handled by front end systems, the backend storage should be a simple, reliable, and appliance like as possible. FreeNAS offers a lot of that, with a native ZFS implementation, backed by a trusted company – iXsystems. Create a common UID on the NFS server and Client. This makes file permissions much simpler. Have everything owned by your “media” user in your “media” share. Configured SABnzbd to work off the NFS mount. SickBeard requires you have some usenet index search APIs. It’s built in search is limited. Set SickBeard to ping Plex to update once a download completes. Double check the built in httpd port. 8080 is the default. Which is also sabnzbd’s port. Set to enabled if you want to use the internal webserver. Further down you can turn on and off what it graphs. SSMTP is a program to deliver an email from a local computer to a configured mailhost (mailhub). It is not a mail server (like feature-rich mail server sendmail) and does not receive mail, expand aliases or manage a queue. One of its primary uses is for forwarding automated email (like system alerts) off your machine and to an external email address. A lot of server side applications (and the next item down in this list) need to use smtp to send you an email notification. When you have automated processes happening at all different hours of the day, often kicked off my some script running headless in the background, it’s sorta a necessary evil. Logwatch is a powerful and versatile log parser and analyzer. Logwatch is designed to give a unified report of all activity on a server, which can be delivered through the command line or email. A key part of set it and forget it is having your system alert you when it needs help, so you can address it before it becomes a disaster. Syncthing replaces Dropbox and BitTorrent Sync with something open, trustworthy and decentralized. Your data is your data alone and you deserve to choose where it is stored, if it is shared with some third party and how it\’s transmitted over the Internet. OpenStack Deployments Are Up, And So Is Ubuntu—But Will It Stick? This year more than 5,000 people showed up to the OpenStack conference, and 1,780 people filled out a survey that drills into how they\’re using OpenStack. Many of the respondents (60%) came from companies that employ fewer than 500 people, while a dwindling percentage was derived from users at companies that employ more than 1,000 people, compared to the October 2013 user survey (34%, down from 39%). The Orange Box is an innovative, custom designed micro cluster chassis, envisioned by Canonical, and contract manufactured by TranquilPC Limited. The chassis includes a small cluster of Intel NUC (Next Unit of Computing) boards, and is particularly well suited for portable demonstration and local prototyping of cloud workloads. The Orange Box, manufactured in the UK to exacting standards is available to order and ships internationally (free of charge). In aggregate, this micro cluster effectively fields 40 cores, 160GB of RAM, 1.2TB of solid state storage, and is connected over an internal gigabit network fabric. A single fan quietly cools the power supply, while all of the nodes are passively cooled by aluminum heat sinks spanning each side of the chassis. Six GBE LAN ports (all connected to the internal switch) are exposed to the rear panel, for external access, or even clustering of multiple Orange Boxes together. It\’s hard to shock an audience at a technical conference. Mark Shuttleworth, founder of Ubuntu Linux and its parent company Canonical, managed it several times in his OpenStack Summit keynote speech. No news may have been more surprising than that Canonical had ported its Juju DevOps program to its rival\’s operating systems: Red Hat\’s CentOS and Microsoft\’s Hyber-V and Windows Server 2012. Ubuntu\’s Unity 8 Desktop To Be Release As Separate Flavor? “The desktop team would like to add a new flavour (we don’t plan to have any formal releases at this point) of Ubuntu which contains the Unity 8 desktop and the new applications which have been developed for the touch project. The decision was made to stick to LTS bases. In other words the development team will be focused on the very same package base used by Linux Mint 17 for the next 2 years. It will also be trivial to upgrade from version 17 to 17.1, then 17.2 and so on. Important applications will be backported and we expect this change to boost the pace of our development and reduce the amount of regressions in each new Linux Mint release. This makes Linux Mint 17.x very important to us, not just yet another release, but one that will receive security updates until 2019, one that will receive backports and new features until 2016 and even more importantly, the only package base besides LMDE which we’ll be focused on until 2016. Antergos is partnering with the Numix Project to create an exclusive edition of Numix Themes for our desktops (both GTK and QT). In this RC, you will be able to enjoy some premature advances of this agreement in the form of the icon theme. We’re not sure if the rest of the design will be make it into this release or if it will be postponed until next stable release. Straw Poll: Do you trust critical data to Btrfs? Help save my library budget with Linux!